Sri Sri Ravishankar Ji is an enlightened Master and World Leader in human development who is honored by innumerable national and international bodies. He is the inspiration behind many charitable organizations around the world. In His presence many lives have blossomed, innumerable people have found a lasting transformation. 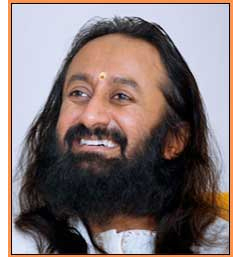 Sri Sri Ravi Shankar is the founder of the Art of Living Foundation (1981) and the International Association for Human Values (1997). The Art of Living Foundation is now one of the world's largest volunteer-based educational and humanitarian organizations. This unassuming humanitarian from India has dedicated his life to a violence-free global family, transcending the boundaries of religion, nationality, race, caste and language. Since an early age, he has been championing the cause of the underprivileged and the marginalized sections of society. Through the Art of Living Foundation and International Association of Human Values, another organization founded by him, Sri Sri Ravi Shankar has brought peace and joy to billions of people in over 152 countries.